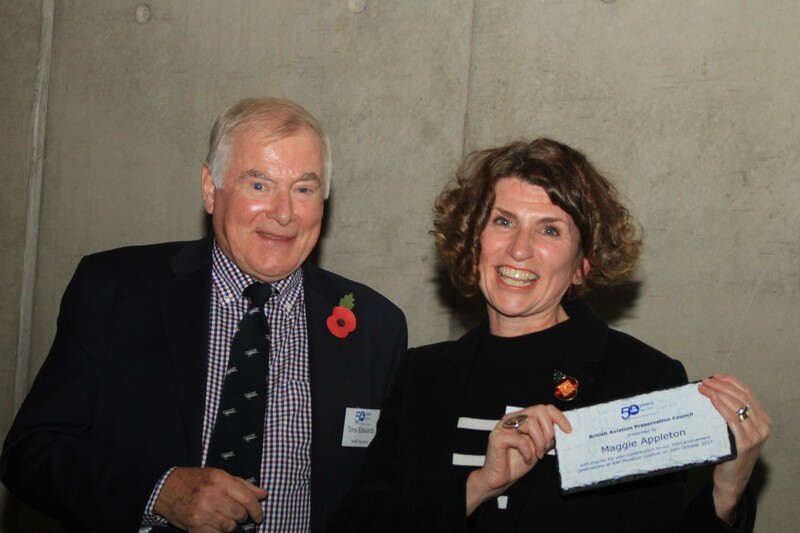 The British Aviation Preservation Council became Aviation Heritage UK during the 50th anniversary meeting at the RAF Museum Cosford on Saturday 28th October 2017, fifty years to the day that the organisation was formed. The change of name better reflects the aims and ambitions of the organisation into the next 50 years and brings with it a new modern logo. Almost 100 members and guests attended a very successful day where the history of the BAPC was celebrated in a presentation by it’s founder John Kenyon and future plans for Aviation Heritage UK were revealed by Chairman Robert Pleming. Keynote presentations by Maggie Appleton MBE, CEO of the RAF Museum, Uli Willbold, Head of Heritage at Airbus, Sir George Cox, Pro Chancellor of The University of Warwick and Sqn Ldr Rick Lipscomb from the RAF Heritage department were supported by member presentations from The Midland Air Museum, The Bristol Aero Collection and The Medway Aircraft Presentation Society. Aviation legend, Martin Withers gave a presentation on his part in the Black Buck mission to the Falkland Islands in Vulcan XM607, a turning point in the 1982 conflict. A visit to the Michael Beetham Conservation Centre ended a memorable day.